All three disciplines are necessary, but not sufficient individually - only all three combined are necessary and sufficient to achieve success. You must develop a trading personality which integrates all 3 issues to reach long-term success in trading the markets. If you do not, you will fail at trading success. 4. 95% of futures traders concentrate on trading methodology and ignore disciplines two and three. If you only focus on trading methodology, you will eventually fail in speculation. The only question is when you will fail, not if. 5. Psychological problems are caused mainly by uncertainty . . . which creates fear, greed and anxiety. 6. Uncertainty can be significantly reduced if the trader has information and knowledge which creates certainty rather than uncertainty. Certainty reduces fear of the unknown, greed, anxiety, and creates confidence and success. 8. Brokers' statements provide absolutely no value or practical use in mastering the three disciplines. 9. To master the money management discipline, the trader requires information which is: a. timely; b. accurate and; c. practical. All three tests are necessary and sufficient. Each individual test is necessary but not sufficient. 10. Futures trading is just like running a business. If you do not approach trading in the manner of a successful business, (such as IBM, Sony or Apple Computers) you will. Probably fail in the long run. 13. You must play as the casino itself, not as a customer to achieve long-term successful speculation. 16. The best approach is to play a game where you have a positive expectation and make small bets (playing as the casino). The 5% of traders who succeed fall into this category. The worst case is to play a negative expectation game and make large bets . . . Most of the 95% traders who fail are in this category. 18. Before you make your first trade, you must establish monthly, quarterly and annual goals for each profit center. These goals should be both operating and financial goals. Losing significant amounts of capital can be avoided if the trader is making a sincere effort to integrate the 3 disciplines into his/her personality. 20. 95% of traders do not know where they have been, where they are or where they are going in their trading. They operate like a plane in a fog trying to fly with no instruments. They are disorganized, uncertain, anxious, fearful and eventually are forced out of the speculation game. If you emulate this 95% group of individuals, you will wind up equally frustrated and you will eventually fail. 21. The more you trade (day trading), the more sophisticated your money-management discipline has to be. 22. The less you trade (long-term positions based on fundamental analysis), the less sophisticated your money-management discipline can be. 25. Having timely, practical and correct information of trading results instantly available enables the trader to make rapid, unemotional and informed trading decisions. Trading should be less powered by high emotions and instead more "scientific," (i.e. How W D Gann traded the markets - see below) unemotional and more mechanical trading without deviation. 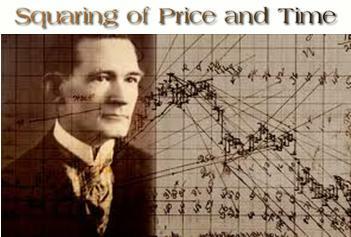 Here are some (but not all) of the key subjects covered in our highly recommended Gann Techniques Trading Course, which can effectively be used to trade stocks or commodities using amazing Gann techniques: Did William D. Gann use Astrology in his Trading? (the answer may surprise you), Square Chart Definition and Usage; Squaring Price and Time; Geometric Angles; Angle Concepts; Gaps on Charts; What Causes Chart Gaps; The Gann Square of Nine and other powerful Gann trading methodologies, plus more about How To Square Price and Time.